(TB2YA5D) Todie's Wild Ride Geocoin - Todie's Wild Ride: Ride Safe! Todie's Wild Ride: Ride Safe! Use TB2YA5D to reference this item. To travel the world in memory of Todie Joe Phillips, spreading awareness of bikes on the road, and promoting safe driving. 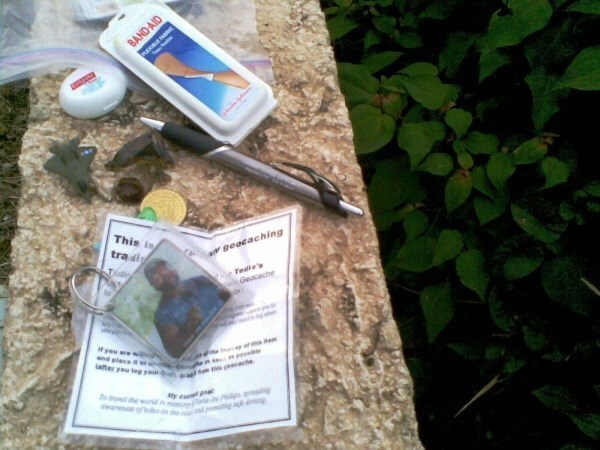 Todie Joe Phillips was a geocacher from Michigan, tragically killed by a careless driver, while biking. He was a wonderful, gentile soul, missed sorely by everyone who knew him. These coins were minted in his memory, by his closest friend, another wonderful soul, Rockin Roddy. When driving, please always check twice for bikes. Don't answer your cellphone, and Share the Road!!! When biking, please ride safely! Look all around you paying attention to the other drivers, and ALWAYS wear a helmet! The helmet may not look cool, but it could save your life. No matter how safely you ride, you can't predict the other drivers on the road and you have so much less than they do protecting you. My stepsister was saved by her helmet bicycling, when she flipped over her bike and landed on her head! Ride safe! Share the Road!! Gallery Images related to Todie's Wild Ride: Ride Safe!